About 18 months ago, my husband Tony and I started planning to move away from Houston. We worked hard to purge the things we no longer needed and prepare our home to be ready to sell. We even had a few private showings. And then we paused. Tony and I are very close, but we didn’t really talk about it at first, we both just knew something wasn’t right with our plans. I won’t bore you with all of the details. But, ultimately we decided that the pause button should stay pressed for a while. The move would have included building a new house. As a designer, I could probably build one about every other year. My brain is constantly designing and creating. So, building a new home (that I have already designed in my head), was something I was very excited about. However, at some point during the past year or so, we realized we love this home. We love this floor plan, the yard which borders the forest behind our home. The livability here is perfect for us. We love our town, the hiking trails, the restaurants, the shopping. We have people we love here too! In truth, there are many things we love about the Houston area, just not necessarily the weather in August! So, for now we’ve decided to keep our Houston residence as our home base. If I’m being honest with myself, it’s the first house we’ve had together that feels like our home. Tony’s career involves real estate projects that do not always require a more permanent move. (You can read about our journey including working on three Hawaiian Islands HERE). Perhaps it will be our home base forever…perhaps not. Either way, the future looks bright and we are happy with our decision. Therefore, after 18 months of making no significant changes or improvements to our home, I’m ready to do just that! I want to do everything at once (and there is a LONG list), but Tony is making me pace myself. So, for now I want to share with you all where I started. The day after we made our final decision to stay, I went to three paint stores and came home with a lot of paint chips. 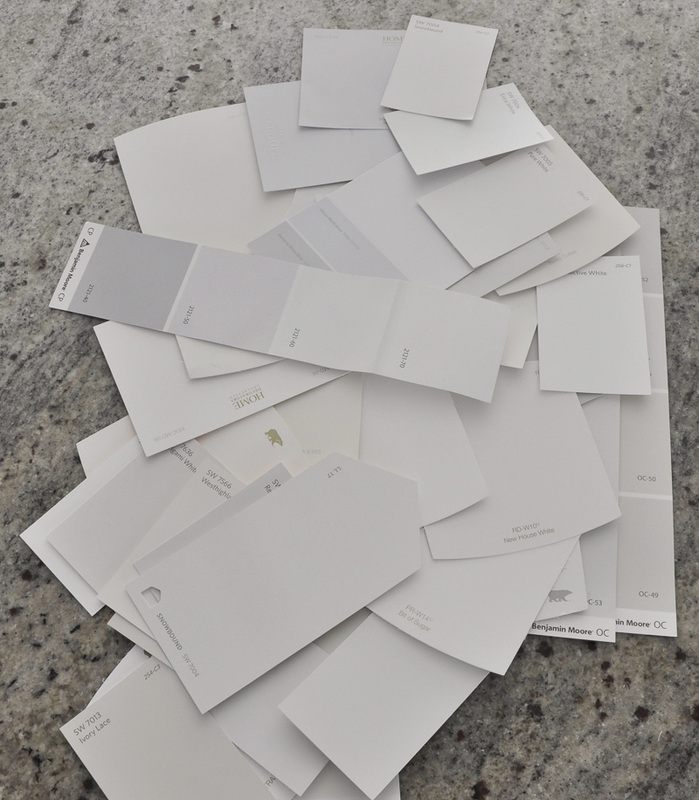 I narrowed my pile down to a few finalists and then made my choice and headed back to the paint store. (I shared my whole selection process HERE). I’ve been picking out paint for clients for many years. It was by far more difficult to pick it out for myself. Are you ready for the result? This is how it turned out. What do you think? It is so much brighter and makes such a perfect backdrop! 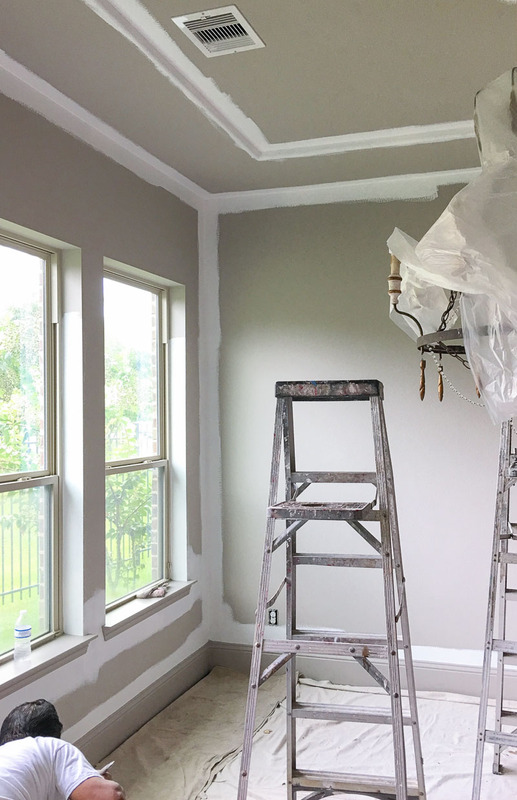 I ended up with the white color that I thought I would pick before picking up samples, Chantilly Lace by Benjamin Moore and I am thrilled with it! I never thought my walls were very dark before, but look at the difference! The walls are so much cleaner and brighter! We didn’t paint the entire home. 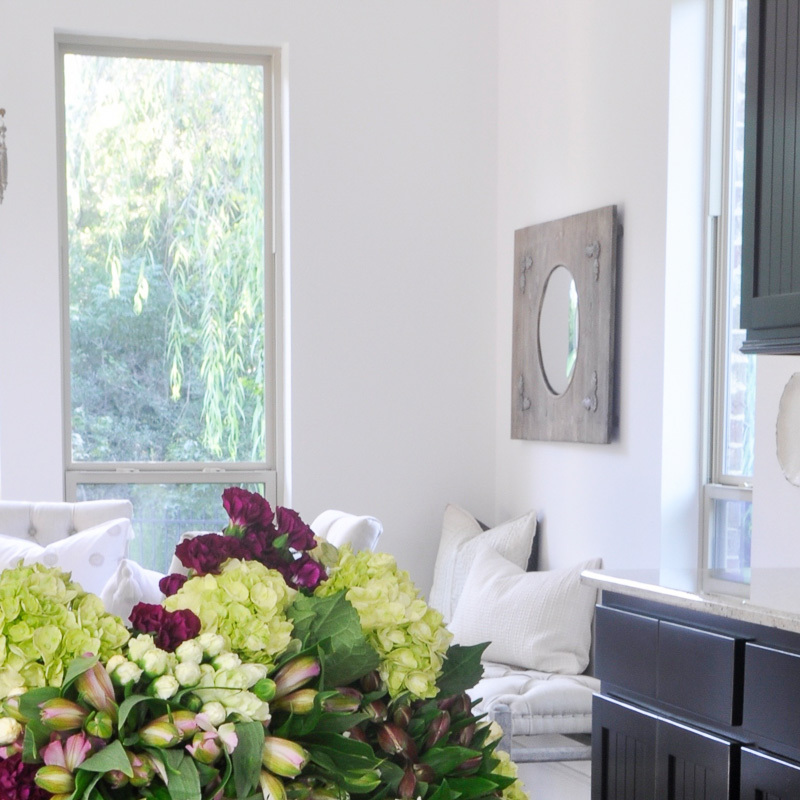 I focused on the rooms that are part of our open concept living space. 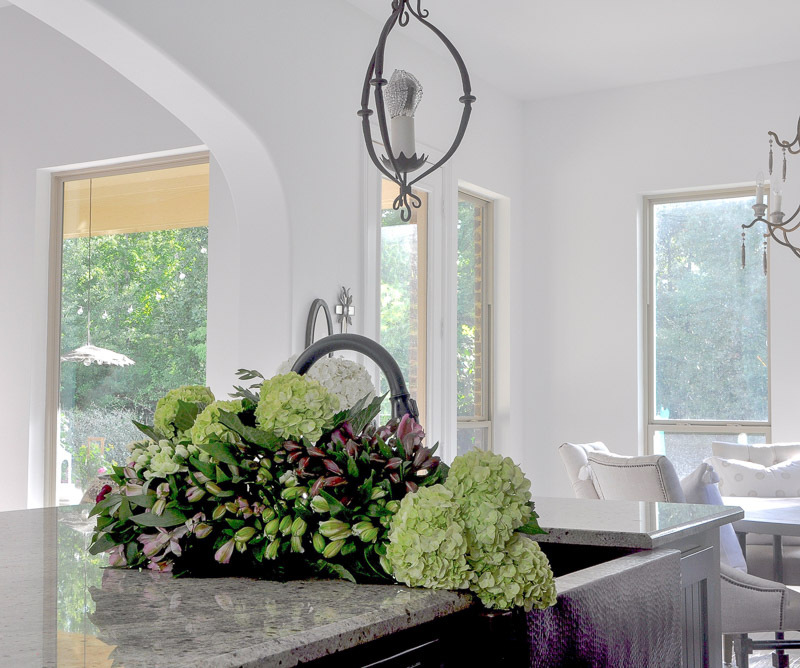 (Learn about decorating an open concept home in this post). Here’s a small peek into our living room. I’m in the beginning stages of making some changes in here, but I feel like the brighter walls were the perfect place to start. The color we had before is taupe or greige. I kept it in my office, bedroom, master bathroom, one of the guest rooms and a few other small spaces. Many of you have asked about the color. However, it’s a custom blend, so I can’t provide the name for reference. The saying “life throws you curve balls” is quite accurate. We have recently realized this more than ever before. It’s okay though because sometimes those curve balls form a circle and help you realize you are right where you belong. Let the projects begin! I can’t wait to share more of them with you! Never miss an update by subscribing to my newsletter! 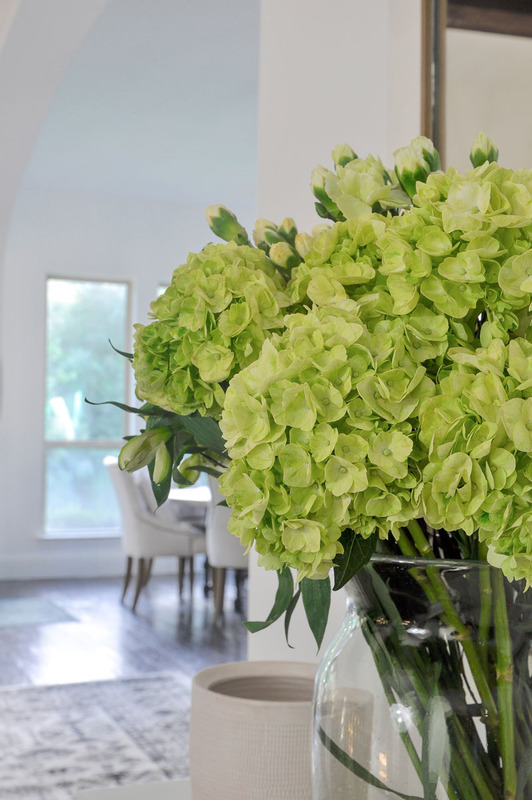 You’ll be the first to know about all of our projects, decorating tips, and much more! Love Chantilly Lace…..we used it on our kitchen cabinets…it;s a perfect white! Yes, perfect! I love it too! I love it! You said you used BM Chantily Lace on the walls. Did you use a flat finish again? Also, what color white did you use on your trim? Thank you! Can’t wait to see the finished pictures. and I am glad you are staying where you are most happy, I wish you both the very best. Sometimes a fresh coat of paint is all we really need. Glad you are happy with your fresh bright new color. Hugs. Good for you!! My husband and I made a move from Houston almost 2 years ago. We lived in West University and had just finished building our dream home there. We moved to Syracuse, NY to be closer to my family in Canada. That being said, we miss very much the proximity to the great restaurants, shopping and our friends. Houston is a great city with so much to offer. I think you’ll be happy there for many more years!! Congratulations on your decision and I look forward to your new projects! I love the change! Do you work as a designer or do you blog only? I had not realized you were in the Houston area. I need my master bedroom done and a few other rooms finished up. If you have any interest, would you please email me with info to contact you for design work? Hi Brenda! Thank you! Unfortunately, I don’t have time to take design clients anymore. Sorry! We’ve been going through much the same. House prices are soaring here, so let’s sell. Wait!!! Where will we move that prices have not gone up so much? And….we love our house, gardens, neighbours, weather and community by the sea. I love the fresh white color. Chantilly Lace. 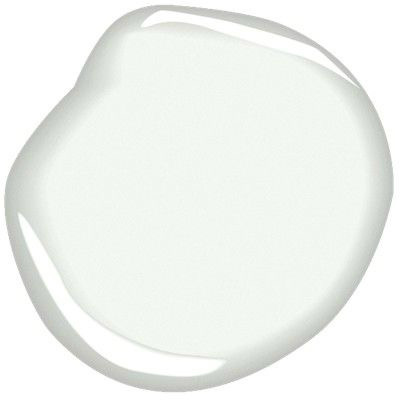 I’ve been going to paint my guest bedroom and bath white. Is it a warm white? It certain looks beautiful in your home. Oh I know….the market here has been a little crazy in the past few years! We were going to move out of state, so we weren’t sensitive about that, but I totally understand! Thank you for your kind works about Chantilly Lace in my home. 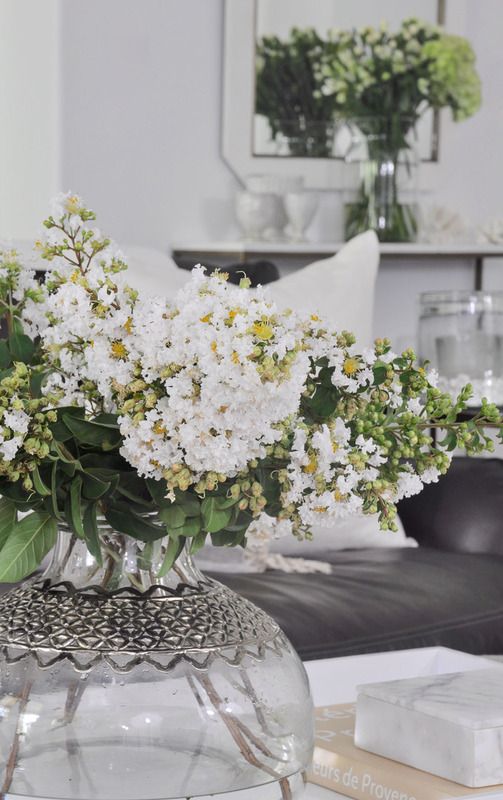 I wouldn’t call it a warm white, but I’m going to share a few on the blog in the next week. I just need to finish my post, so please check back! This has been such an amazing journey all the way around. I love this color and our decision. Can’t wait for the next update!! Just gorgeous, Jen! It’s amazing what paint can do! The Chantilly Lace really makes everything else stand out. I love how bright and clean everything is. Congrats on your choice to stay put! I can’t believe you’re staying and you never called me! 😉 I’m so happy for you guys and I know Bree is going to be thrilled. 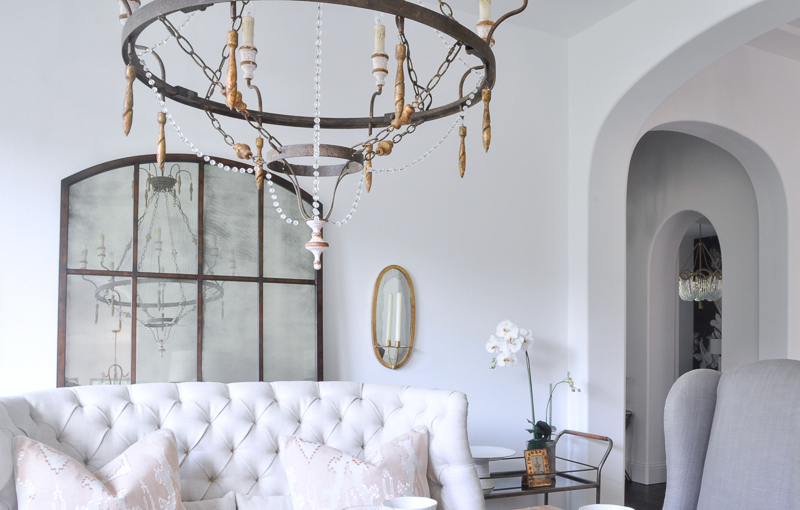 The house looks amazing… Can you believe how beautiful Chantilly Lace looks on the walls? Now you know why I chose it. WooHoo! Let’s talk soon.. we have so much to catch up on! I love it. I will ALWAYS love a fresh bright white, so clean and so crisp. I can’t wait to see the rest of your updates. Me and My wife love painting because it help us to save money and it also help to have most beautiful memorable moments of our life, when Christmas comes we always love to paint our home before a month ago and always give a new look to our home space according to our requirements. Your walls look amazing, Jen! I love the way it brightens up all your accessories! Glad you are happy with your “staying” plans! Thank you Lisa! I was just thinking the same thing…the accessories do like brighter and better! Thanks so much for stopping by! Hey Jennifer, No dought your selection for the colour and interior accessories are really awesome. I really loved the way to used your creative thoughts.Great work!!! I love your choice of white. The change looks fabulous. 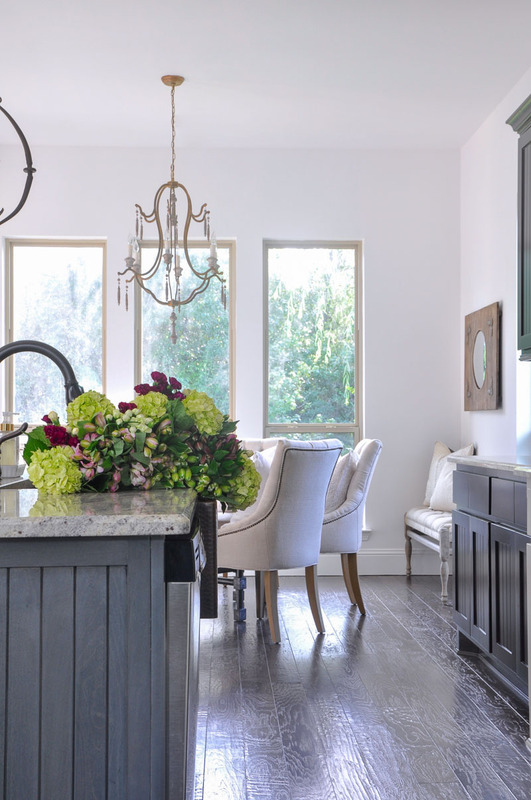 Did you use the same color on the baseboards and trim, but in a different finish? Thank you Maria! I did. I used flat on the walls and satin on the trim.